We’re here at the tail end of 2004. What better way to say something about something than by starting a new painting? I don’t know, because I actually started this one a few days back, so it doesn’t really count. But it might have, had I decided to lie to you and say I just began it, just now. But I decided not to do that, so don’t say I don’t care. Because sometimes I do. Sometimes. Anyway. 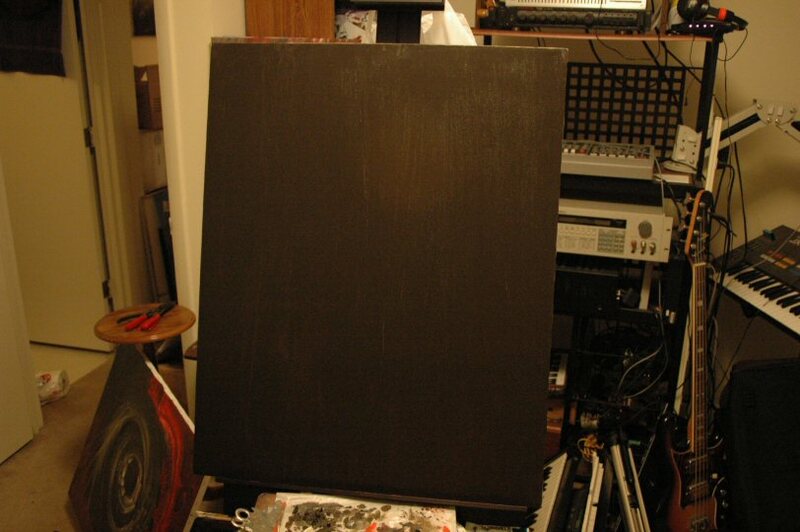 I first decided that this new painting should have an all-black background, and by all black, I mean Raw Umber. In the course of applying the paint directly from the tube to the canvas and smearing it around with my fingers, I thought, Hey, this might make a good photo for the blog-thing! It wasn’t the first time I’ve been wrong, but here’s the picture anyway. 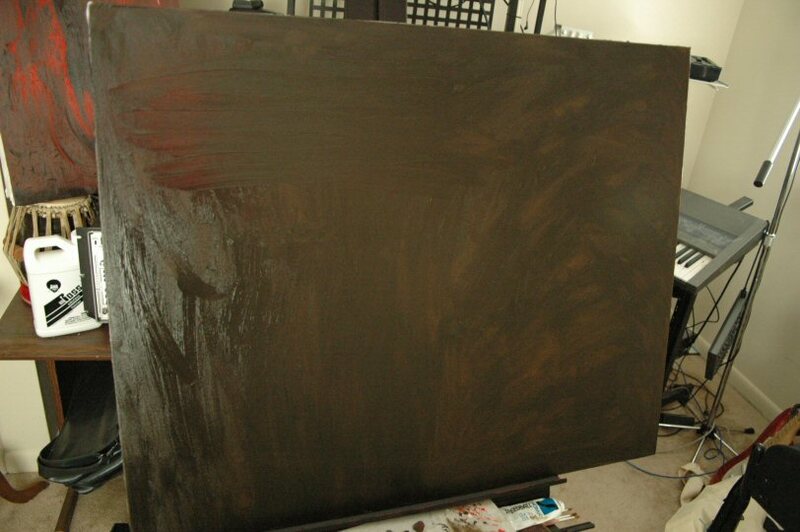 Here’s the same canvas after I had managed to get paint all over it. You can see how wet the pigment is by how much it catches the light. 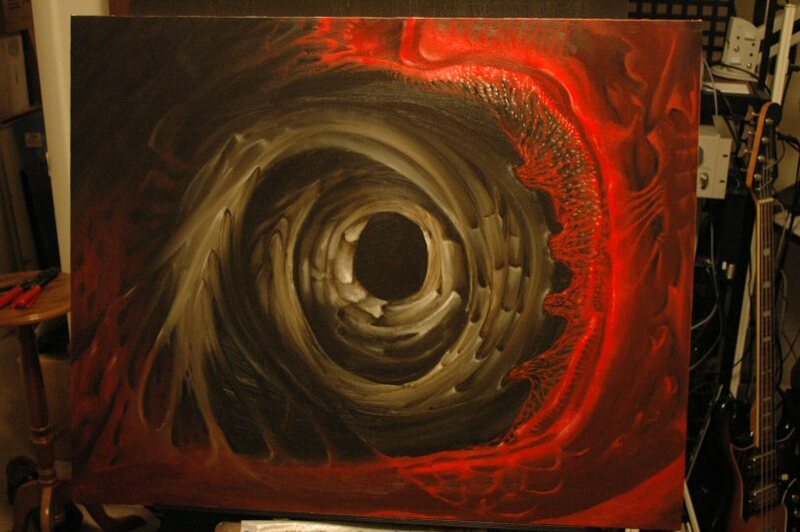 You might think that the reddish-black canvas in the back is also wet because it shines, too, but you’d be wrong. It just shines. But trust me, the one front and center is very wet. 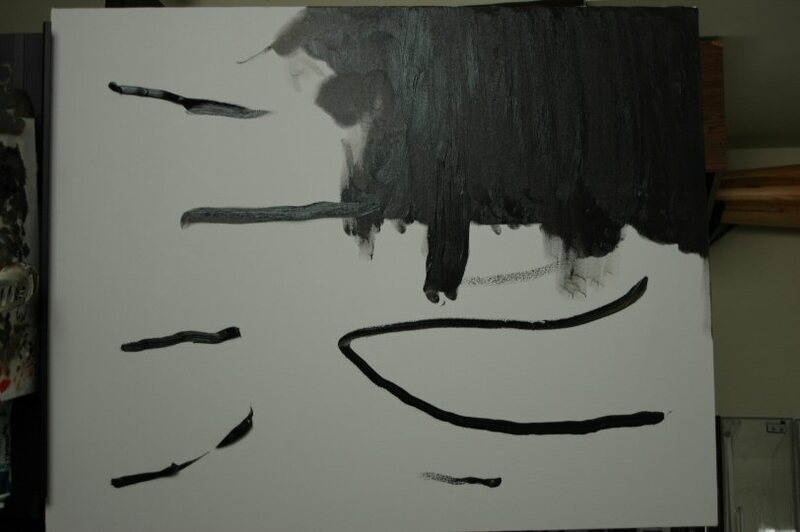 I smoothed the paint out as much as I could, gave the canvas a few days to dry, and then it looked like this. Note that in this picture, the canvas is oriented in Portrait mode. This is how the final work, whatever that might turn out to be, will be oriented. The two pictures showing it in Landscape are oriented such because it’s easier to smear paint on a canvas when it is lying down, as it were. The next step was to wait until some form of inspiration hit. The form that it took was masking tape. 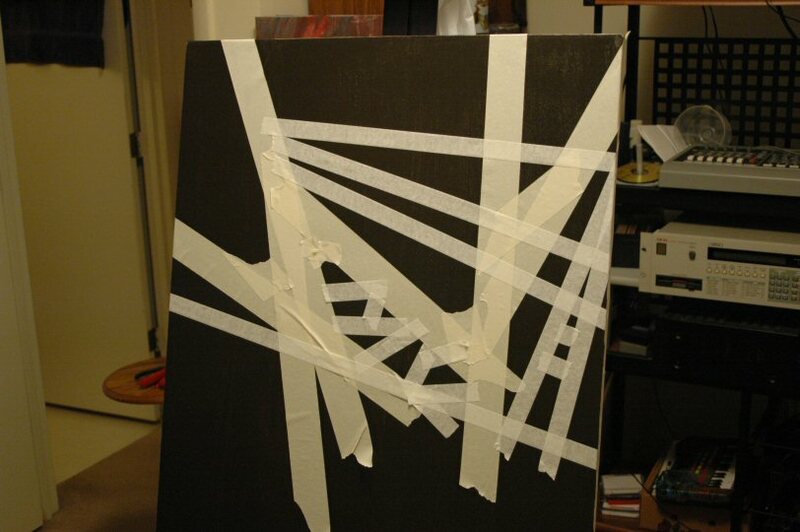 Masking tape is great for making straight edges in a work; you just line the tape on the canvas, paint up to and over the edge of the tape, and when you peel the tape off, voila: a straight edge. However, I didn’t want to use tape just to do that. I wanted to create a lattice or framework of some kind, so I put the tape up where it felt “right,” whether it was or not. 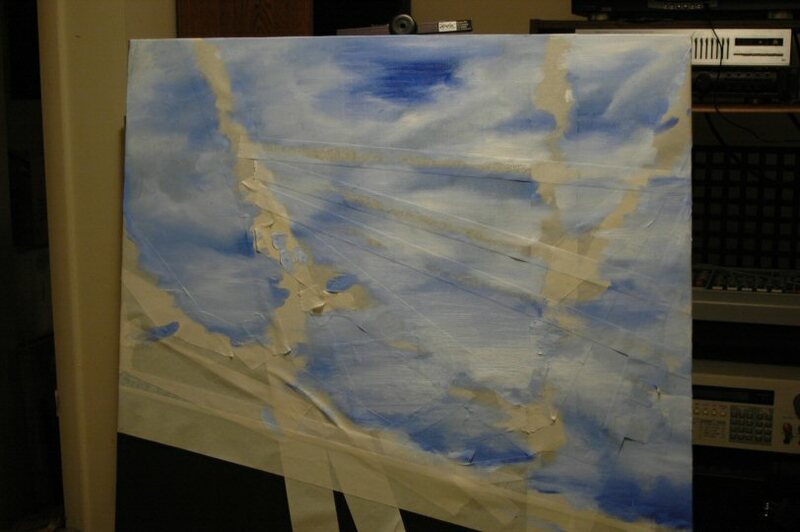 Note that the tape is, for the most part, in the upper part of the canvas (it’s actually hard to see that, isn’t it? I was focusing the camera somewhat closer than I usually do, so some of the canvas is cropped off at the bottom). When that was done, I took some time to think about that, about what ought to be placed in (essentially, behind) the lattice. I wanted the lattice to appear somewhat like an enclosure, so I painted an open blue sky over the tape. And that’s where it stands as of today. I’m still not certain, completely certain, about the sky, so I may allow it to stand for a while and then do some more work on it (the lower half in particular bugs me a bit, the upper half I think is quite good). And then we take the tape off. Ooo, it’ll be just like that scene in Bride of Frankenstein, remember, where Colin Clive and Ernest Thesiger are unwrapping Elsa Lanchester, unaware of what they’ll find underneath. Will it be some kind of a monster, or might it end up being something else, like a completely different monster? We’ll all find out next year. See you then. Happy New Year to you all! Here’s today’s spam thought. It’s not a short story (unless it’s some character’s argument or internal monologue) but it has a great word in it. I like the fact that the “don’t impose” people at first make little (headway, presumably) from arguing, and then they make little balsam pears. I guess it’s one of those lemons/lemonade things. As with the previous examples, I’ve cleaned up the paragraphs a bit (and added spaces in “1 free style”*) but otherwise I haven’t changed a thing. You gotta love that word, though. “Disencharmdominionism.” I wonder what it means? I’ve got to find a way to work that one into a casual conversation, somehow. *Weird, though. When I switched in Blogger from Edit HTML to Compose, “1 Free Style” became “7 compara style,” and that “Tors 1 free” got tacked on the end. Maybe I should stop reading spam if it’s going to do things like that. Spam is a guest in my blog and it should behave accordingly. Is it done? It has stopped saying anything specific to me, but it still seems as if there is something missing. It’s not saying anything, but it’s still murmuring. In the meantime, here is the painting as it stands today, nearly at the end of 2004. Sorry about all the vintage equipment in the background; I suspect that makes the painting rather hard to make out amidst all the clutter. Still, if I had time to edit that out of the image, I’d have time to clean up the equipment before taking the photo. So everyone wins. The previous chapters are all listed in this Index. Here’s another little bit of a story, tucked away at the end of a spam message. If this goes on, Mr Joslyn said to his son, when breakfast was finished, I shall be obliged to send you away for your health. Oh, I may go to Boston, or take a run over to Cuba or Jamaica, replied the boy. I’m thinking this one was written by the same person who wrote the last bit I posted. The style is kind of similar, as is the lackadaisical approach to punctuation. Still, seeing it again is kind of…cool, in a way. Much as I dislike spam, this sort of thing makes me feel sorry for the poor folks who are forced to grind it out. You imagine some sweaty hothouse, workers hunched over keyboards pounding out drivel about medicine, mortgages and marital aids, and every now and then sneaking in some bit of the novel they’re working on. One imagines it is their only joy, in a dark joyless world. man had apparently been hunting, gotten lost and stopped a couple of hunters to ask for directions. This guy sounds like he’s been taking too much of that cheap medication you hear so much about. I wonder if “Watkins supervisor, Tyrone” is the author’s signature? Supervising Watkins must be one heck of an important job. Just got a spam email in one of my accounts; normally I just delete without reading (which is the best thing to do) but I was curious who it was addressed to, so I opened it up. Strange, huh? To me, it looks like whoever is cranking this stuff out is bored our of his or her mind, and is trying to write short stories (or movie treatments, maybe) just to keep from going nuts. I wonder how widespread this sort of thing is. As I said, I don’t read spam, and I’m not tempted to start because of this, but it is a kind of weird glimpse into some unknown realm. Amazon.com has set up a donation system so folks can contribute to the disaster relief effort underway for victims of the recent tsunami. I know that sentance isn’t right, somehow, but if you can afford to give anything, you should. I can’t really afford to give, but I did anyway. Well, I thought “Meet the Fockers” would be in first place, though I didn’t say anything about it. In fact, I didn’t say anything about any of the new releases this weekend, because I found most of them uninteresting. “Fockers,” as several members of my family noted, will probably have many jokes about mispronouncing the name–always hilarious. “Fat Albert” I thought was doomed when they decided to open it on Christmas Day. Who goes to the movies on Christmas Day? Generally speaking, one should be occupied with presents and good cheer and all that. Going to the movies on Christmas Day is a sign of desperation, a sign that one got no presents worth one’s time and effort, and that one’s company is uninteresting. What shall we do? We are utterly bored out of our minds, on Christmas Day, no less. Hey, let’s go to the movies! Apparently not many did. “Lemony Snickett” fell to a rather far second, while “Oceans’ Twelve” and “Spanglish” fell quite a bit. “The Phantom of the Opera” opened at number 10, which I think shows that its day was a few years back. Isn’t this just absorbing, though? Yes, I thought so as well.